In this article I wrote that in our training courses we often invite our participants to have a 20 minute walk right after lunch and to talk about the homework they chosen to do. We call this part of the training homework-walking. I wrote in that article that having such a walk works quite well, because, among other things, it boosts your brain activity (see here). Now, some new research has been published which show that walking stimulates creativity. In this article Marily Oppezzo and Daniel Schwartz (2014) explain that they have done four experiments which showed that walking (especially outdoors) enhances the generation of ideas. The experiments show that walking especially stimulates divergent thinking (creativity) and not convergent thinking (the process of choosing one correct response or reaching one conclusion). The researchers also demonstrate that this creativity-enhancing effect of walking even continues for some time after one has stopped walking and have sat down. The figure below shows the creativity scores for different combinations of sequences of walking and sitting down which the researchers have tested. 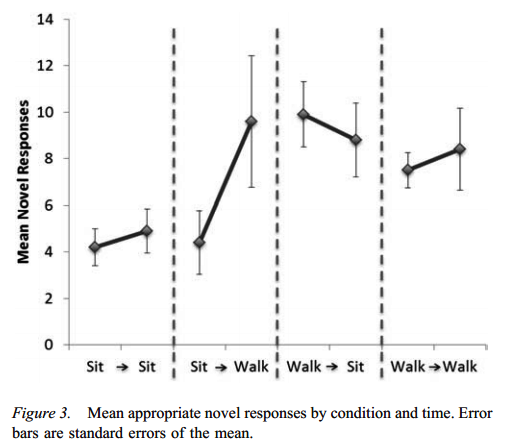 Reading about these studies makes me think that we might talk much more advantage of walking. Perhaps you have already heard about the concept of walk-coaching. Perhaps we should also consider to start to have walk-meetings, walk-writing sessions (? ), walking application interviews, etc. Question: do you have more ideas about how we might use the power of walking in work situations?